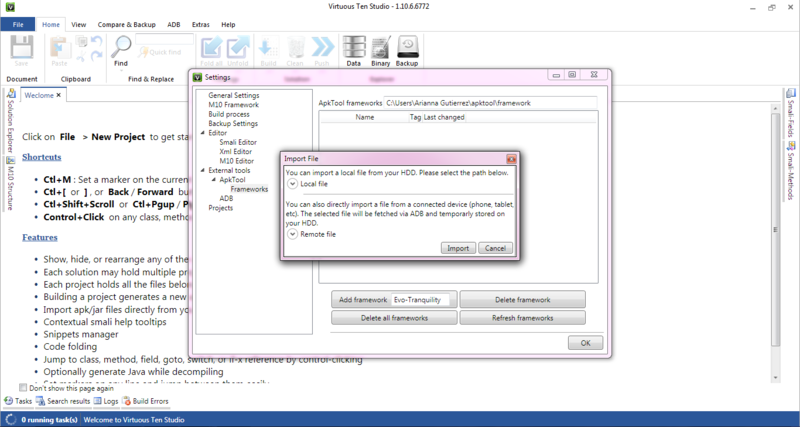 This article will explain how to setup VTS. The first step is to go to Downloads and install VTS. Next open VTS and go to “File” on the upper left hand side. From this menu you will be able to create new projects, open current projects, view the settings, access the “About” menu and do some other things. On the upper right hand corner click on “Activate licence” and a popup window will appear. Next, navigate to the location of your licence and open it. You have now activated your licence. For the next step click on “Open Settings“. A new window will appear and “General Settings” will be highlighted. 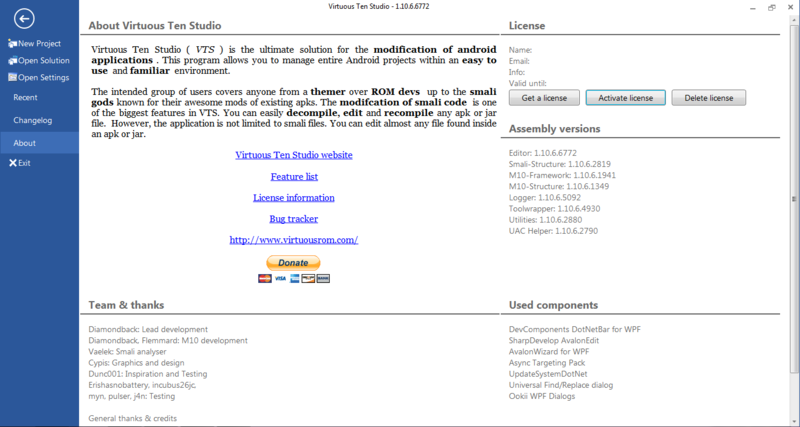 From here you are able to search for updates, change the design color of VTS, and install your framework files. 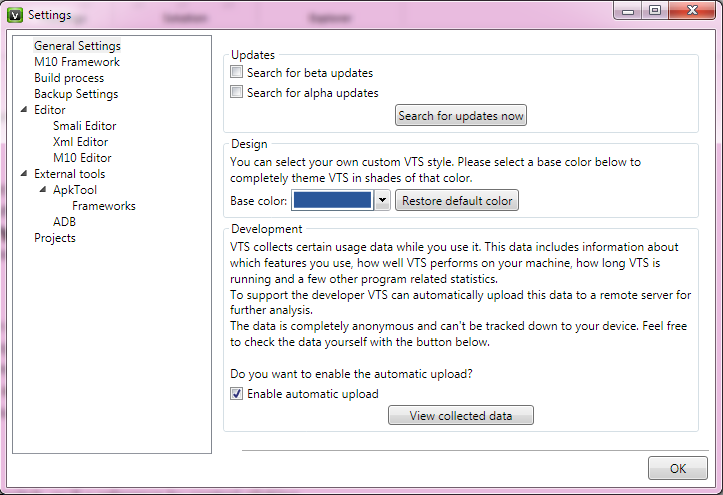 To change the look of VTS click on the “Base color” dropdown and select your prefered color. Look at the “Add framework” button, notice the text box with the word “tag” in it. In this text box you can type in a framework tag in case you have multiple frameworks for multiple devices or different Roms. For example, I have an HTC Evo 4G LTE and I am running Tranquility Rom. I would type in Evo-Tranquility as a tag. That way I know that is the framework for that device on that Rom. Next you will click on the “Add framework” button and a popup window will appear. If the framework files are located on your device, make sure your device is connected and click on the round button next to “Remote file,” then click on the arrow next to framework in order to view all your framework apks. Now click on the framework apk you wish to install. Make sure you use the same “tag” on both framework files for the same Rom/Device. Press the “OK” button on the bottom right hand side of the settings menu. You are now ready to begin Setting up your first project.